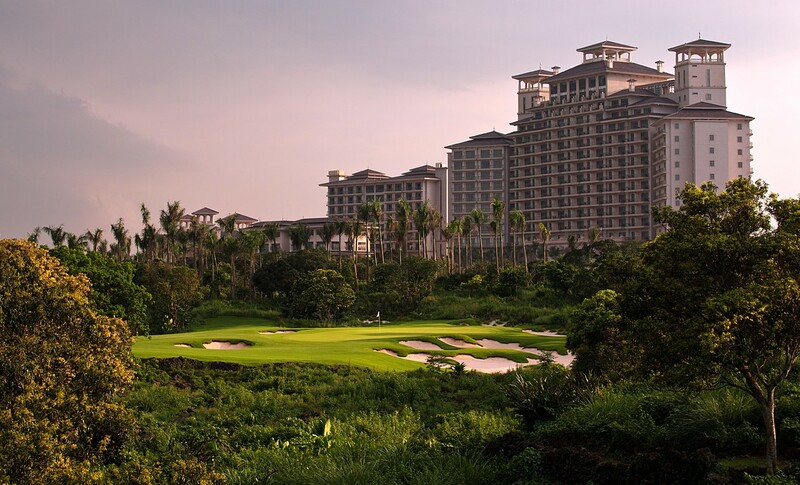 The centerpiece of the impressive Mission Hills Haikou Resort, the Blackstone Course was designed by Brian Curley as a strong, championship-length test that could be used to host prestigious professional events. 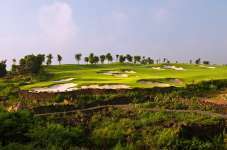 In its short life the course has already hosted a number of significant tournaments, including the World Cup of Golf and the unique Mission Hills Celebrity Pro-Am. Beginning and ending in the shadows of the imposing Clubhouse and Hotel, Blackstone was intended from the outset to become the primary golfing attraction of the resort. It occupies a more generous piece of ground than the other nine layouts, with holes set across a vast 350-acre tract of lava rock. 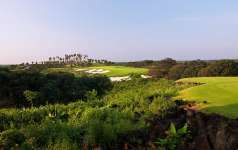 There are a handful of sizeable wetland areas toward the end of the round, as well as plenty of attractive undulations and dense jungle vegetation, but the overwhelming sense here is of golfing across and between the black volcanic rubble. As the showpiece golf course, Curley was allowed more freedom with his Blackstone routing and able to display more daring in his design. While at times too difficult for the average amateur, holes are nonetheless beautiful to look and exciting to play. The bunkering across the layout is stylish and strategically arranged, while putting contours are generally set to reward those cerebral golfers able to approach greens sensibly and to visualize deft recovery shots. Most green complexes have one area that is virtually impossible to recover from, and part of the challenge here is in indentifying these spots and then doing your best to avoid them. The difficulty of Blackstone is apparent from the very first hole, a mid-length par four with a super-shallow green that falls away more than ten feet at its rear. Those unable to precisely control the distance of their approach shots here are in for a frustrating start. The next is a terrific par five which, like the 6th hole, bends left and then right through rock and around a series of impressive bunkers. As with some of the best holes in world golf, they favor skillful players able to move their ball both ways through the air. Another hole that rewards accuracy and precise driving is the intimidating 518-yard par four 4th, which runs along a narrow fairway ledge that falls to the right and is heavily bunkered on the left. A dangerous green then rests in a natural clearing beyond a pronounced fairway dip, and is really only accessible to those who have been strong and straight from the tee. The next is one of the most picturesque at Mission Hills, a short all-carry par three across a rocky gully. The green here, like at the short par four 7th, is one of those broad, sloping targets where clever golfers can use contours to their advantage when chipping or playing from sand. The remaining front nine par three, the 8th, is another fine hole and also played across a rocky ravine to a beautiful green site, this time seemingly at the base of the towering hotel. 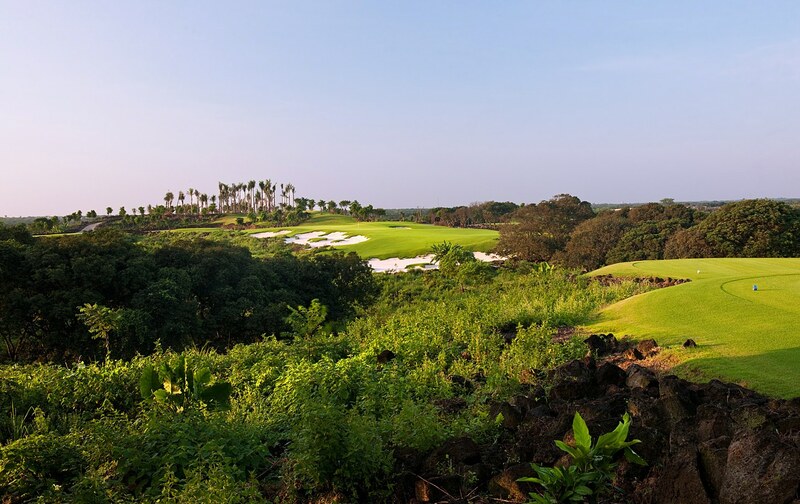 While holes on the front nine are enclosed within the dense vegetation, the last half of the back nine is completely different and has a far more expansive feel. This is due to the lack of palms and ancient Lychee trees, and the existence of large wetland areas, particularly on the closing holes. Tee shots on the driveable par four 16th and the longer 17th, for example, both need to carry the main lake, while the finishing hole is an angled par five that leans toward a sprawling body of water stretching most of the way up the right-hand side. Whether you are good enough to feed your second shot onto this green and close with an eagle putt or not, the risk/reward nature of these hazards, as well as the stunning clubhouse backdrop provide a memorable end to the round. The Blackstone course at Mission Hills is certain to appeal to golfers who embrace the modern adage of longer and harder golf as well as those that appreciate the beauty and drama of such a striking golf experience. It should also please most traditionalists. Designer Curley deserves full credit for striking a chord with each group. His decision to do away with rough and concentrate instead on a single cut of turf between the lava was a bold one. This lack of obvious fairway definition together with those gnarly bunkers and their irregular transition lines give Blackstone an old-school feel but with a unique contemporary edge. 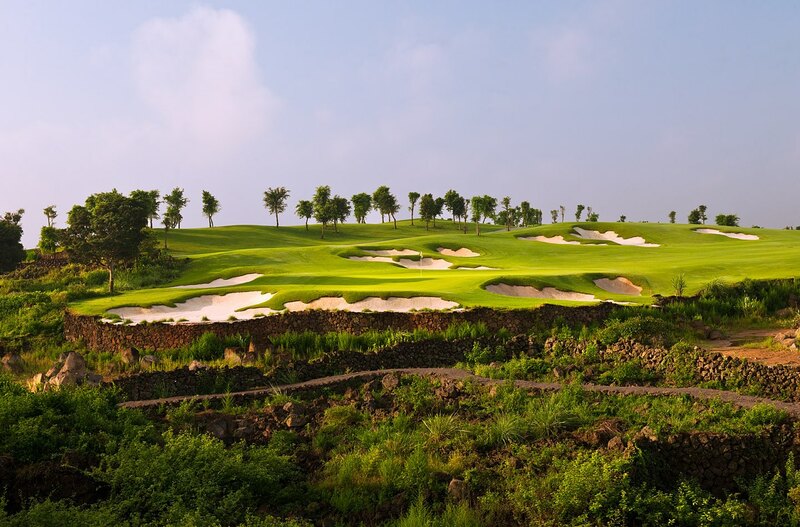 From a design perspective this was a significant achievement for Curley and for the wider Chinese golf community.